A beautifully presented detached four bedroom much improved property with further potential still to create additional accommodation, STP. With garage, driveway parking and well laid out rear garden this is a great opportunity to purchase a ready to move in to home in a sought after part of Ashburton. EPC D. DESCRIPTION A fantastic opportunity to purchase a detached, well presented, four bedroom property with parking, garage and gardens on the eastern edge of the sought after Dartmoor town of Ashburton. The accommodation is particularly well laid out with a good sized kitchen/breakfast room to the rear and lounge to the front of the property, with the three ground floor bedrooms overlooking the side or rear of the property, all of which are good sized double bedrooms. A family bathroom complements the accommodation. Having been upgraded and now offering a bedroom and study/landing to the first floor there is still plenty of potential to convert the walk-in attic space, subject to any planning permissions or building regulations approval. All in all this is well presented detached bungalow in very good order, with driveway parking, garage and gardens and yet still offering potential to create additional living space if so desired. LOCATION The stannary town of Ashburton offers a wide range of shops and facilities, including both a Primary School and Community College, and is located within the boundary of the Dartmoor National Park offering wide open spaces for scenic walks and riding. Ashburton also benefits from excellent transport links being approximately 7 miles from Totnes and Newton Abbot with their direct rail links to London Paddington and Plymouth. The town also lies just off the A38 Devon Expressway giving easy access to Plymouth and Exeter and the M5 beyond. ACCOMODATION For clarification we wish to inform prospective purchasers that we have prepared these sales particulars as a general guide. We have not carried out a detailed survey, nor tested the services, appliances and specific fittings. Items shown in photographs are not necessarily included. Room sizes should not be relied upon for carpets and furnishings, if there are important matters which are likely to affect your decision to buy, please contact us before viewing the property. HALLWAY Double glazed door with inset stained glass panel into entrance hallway with ceramic tiled flooring, radiator, coved ceiling, recessed spotlights, low level meter cupboard to one side, and wraps round to the rear of the property, further radiator and wall mounted gas fired central heating boiler. Useful under stairs storage cupboard. LOUNGE A lovely room with double glazed windows to the front elevation and feature gas fireplace with timber surround and marble insert and hearth. Wall mounted up lighters, coved ceiling, ceiling mounted light fitting, carpeted. KITCHEN/BREAKFAST ROOM Fitted with a range of floor and wall mounted kitchen cupboards, single sink and drainer with swan neck mixer tap and complementary mosaic tiled splash back, ceiling mounted spotlights, coved ceiling, space and plumbing for a washing machine, tumble dryer and upright fridge/freezer. Stainless steel freestanding cooker with four ring gas hob and double oven under, and stainless steel extractor over. Useful area of breakfast bar to one side, ceramic tiled flooring, radiator. Double glazed door and window to the side elevation. BEDROOM Double glazed window to the rear elevation, coved ceiling, pendant light fitting, radiator, carpeted. BEDROOM Double glazed window to the side elevation, pendant light fitting, coved ceiling, radiator, carpeted. BEDROOM Double glazed window to the side elevation, coved ceiling, ceiling mounted spotlights, radiator, carpeted. BATHROOM Fitted with a four piece suite comprising a panelled bath, pedestal wash hand basin, close coupled WC and corner/quadrant shower with waterfall shower head over and hand held shower attachment, chrome effect radiator, ceramic tiled flooring and recessed spotlights. FIRST FLOOR From the ground floor entrance hall, carpeted stairs rise to the first floor. Velux window to the first floor landing, and a good area of landing space which is currently used as an office. Another door off the landing leads to walk-in access to additional loft space with pendant light fitting. 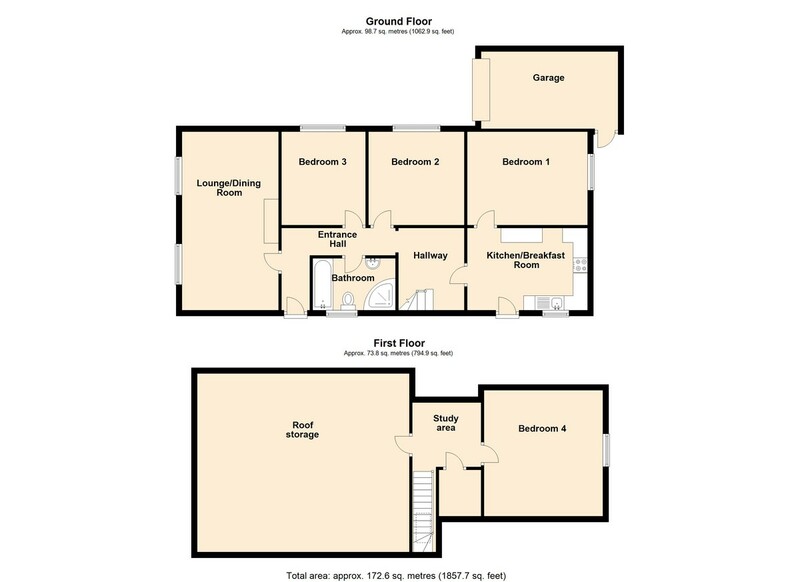 This space could be put to additional use as another bedroom, subject to planning and any necessary consents or regulations. BEDROOM Ceiling mounted spotlights, double glazed window to the rear elevation, carpeted, radiator, useful storage cupboard going into under eaves with lighting. OUTSIDE The rear garden has a paved path leading around to the rear. There is a good area of level lawn with timber edged steps leading up to a raised lawned seating area being very private and with a fenced and hedged boundary. To the front of the property are steps up to a patio slabbed path leading to the front door and electronic double wrought iron gates leading to the brick paviour driveway and garage with up and over metal door. SERVICES All mains services are connected. Gas fired central heating. VIEWINGS Strictly by appointment with the award winning estate agents, Sawdye & Harris, at their Dartmoor Office - 01364 652652. If there is any point, which is of particular importance to you with regard to this property then we advise you to contact us to check this and the availability and make an appointment to view before travelling any distance.